MadBull Airsoft was kind enough to send me some pre-production samples of their new PBS mock suppressors or barrel extensions, and my my, aren't they breathtaking! Even for pre-production samples, these things may as well be the final production versions. The CNC machine work on them is outstanding. 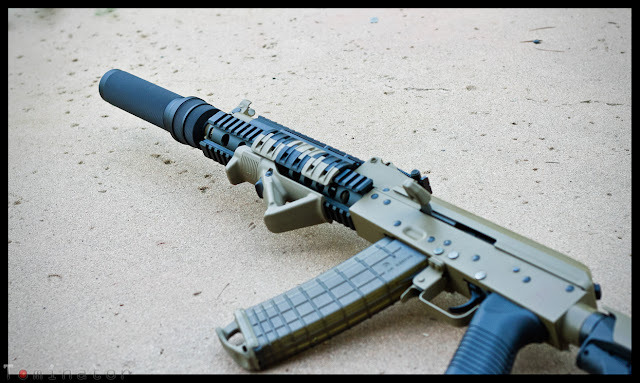 In case you weren't aware, the PBS suppressors were originally designed for use with AK47 or variants thereof (Commie gunz! ), but with the Airsoft versions having 14mm negative (Counter-Clockwise) threading, you can put them on whatever compatible guns you want! But be wise with your choice. Not all guns were created equal. 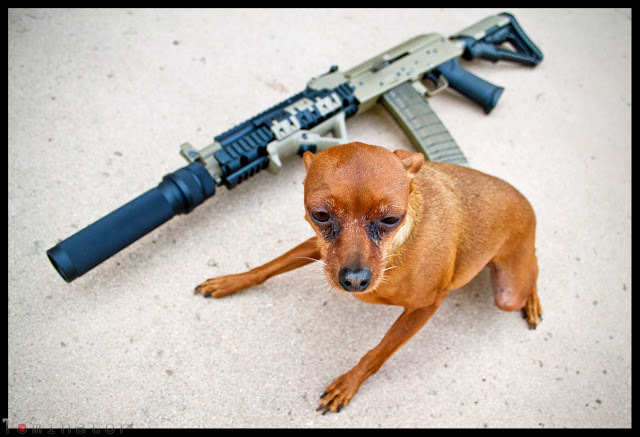 The model on the left is the MadBull PBS-04 AK Mock Suppressor and the model on the right is the MadBull PBS-01 AK Mock Suppressor. They each feature a combination of smooth and textured finishes and are machined from high quality T-6061 aluminum. They are hollow inside and feature MadBull's patented internal design which allows them to meet BATFE's approval. The samples I was sent were very solid, possessing a pretty good amount of weight, each weighing a bit over 1lb, but the fine folks at MadBull have informed me that the final versions will be much lighter. 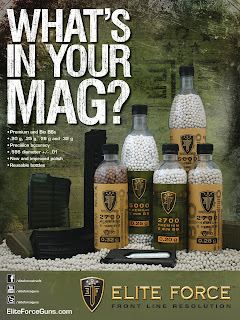 As you'll see below, I've already tested them out on my Beta Project Magpul AK and didn't find the weight to be an issue for me (and believe me, I'm far from being hulked out or otherwise in shape). 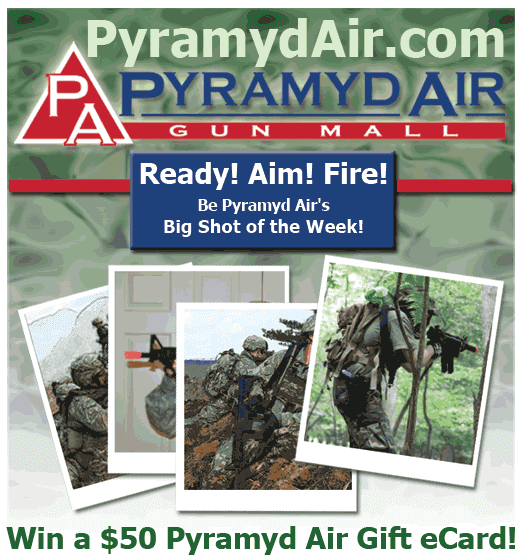 Let's cut the jibber jabber now and get to the MadBull PBS Mock Suppressor Gun Pron now! 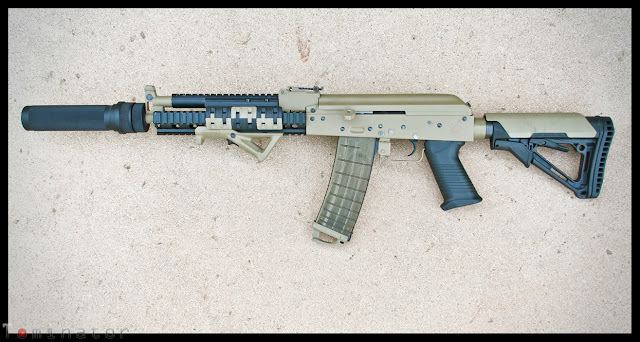 Currently, the only AK I have in my arsenal is the Beta Project Magpul AK and I personally felt that the MadBull PBS-01 looked better on it of the two. I've got a new Echo1 AMD-65 Hungarian AK arriving on Friday and I plan to put the MadBull PBS-04 (not pictured) on it when it does. It should look pretty sick-nasty! Despite his German heritage, General Beauregard definitely approves of these Russian-style MadBull PBS mock suppressors. Still waiting to hear back from MadBull regarding price and release date, but I will include that information in a future blog as soon as I receive it (should be in the next day or two). 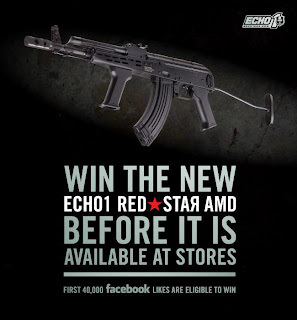 Speaking of the Echo1 AMD-65 AEG, if you like the Echo1 USA Facebook page, you'll have a 1 in 40,000 chance of winning one for freesies!